May 22. When I was a child, the end of May marked the beginning of cherry-picking season in Italy, and for the next month or so I could often be found doing my homework with a big bowl of juicy fruit in my lap, and a few red stains on my books . The decadence of sucking on the cherries is counterbalanced by the zen quality of spitting the pits into a saucer. Ciliegie are the perfect, meditative snack: “una tira l’altra” (one pulls the other, you just can’t stop eating them) – that’s also true of potato chips, by the way, but potato chips aren’t being touted as the next “superfood”. Cherries are actually so good for you that they are now being marketed in the form of capsules. I find that a bit ridiculous: wouldn’t you rather stick them into a pie? At least dip them into white chocolate? Or, if you are being truly virtuous, how about using them for a colorful salad? Whisk the oil, vinegar, honey, salt and pepper to make the vinaigrette and set aside. Toast the walnuts in a small skillet for a couple of minutes. If you are feeling fancy, toast them with a bit of sugar until they become caramelized. 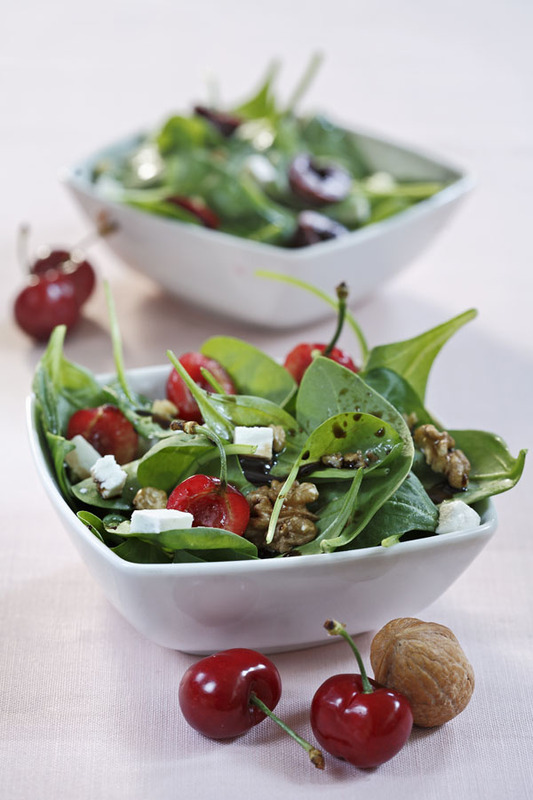 Place the spinach in a bowl with the cherries, the cheese, and the walnuts. Toss with the vinaigrette right before serving. Cherries are up there as one of my most favorite fruits and I’m counting the days until they’re at the farmer’s markets – and I like the uniqueness of combining them with spinach and feta…nice! I just picked up a wonderful bag of cherries. I was thinking to do something like this! Love the colors in this salad. It takes two seconds to remove the pit if you halve them. Then again, I do love gadgets. I just can’t fit them in my Manhattan kitchen! Great idea – I’ve never though of putting cherries in salads. The furthest I’ve gotten is steeping them in Maraschino liqueur last summer as a trial for a blogpost I wrote. Need I say they were delicious? Looks delicious. Thank you very much for all that you share. Thank YOU for being a regular follower, Susan! Lovely looking and the combo of sour cherries and bitter greens, tangy cheese and crunchy nuts is fabulous. I can’t use walnuts but this is so beautiful, I have to try it with almonds or cashews. So excited for cherry season, great idea to put in a salad, they look so nice with the stem still in them. As long as you don’t eat them, the stems do look nice. Cherries are one of my absolute favorite fruits! My mouth is watering. Cherries are my favorite fruit, and I love cherries and nuts together. Not a fan of feta, but I see how this salad works. 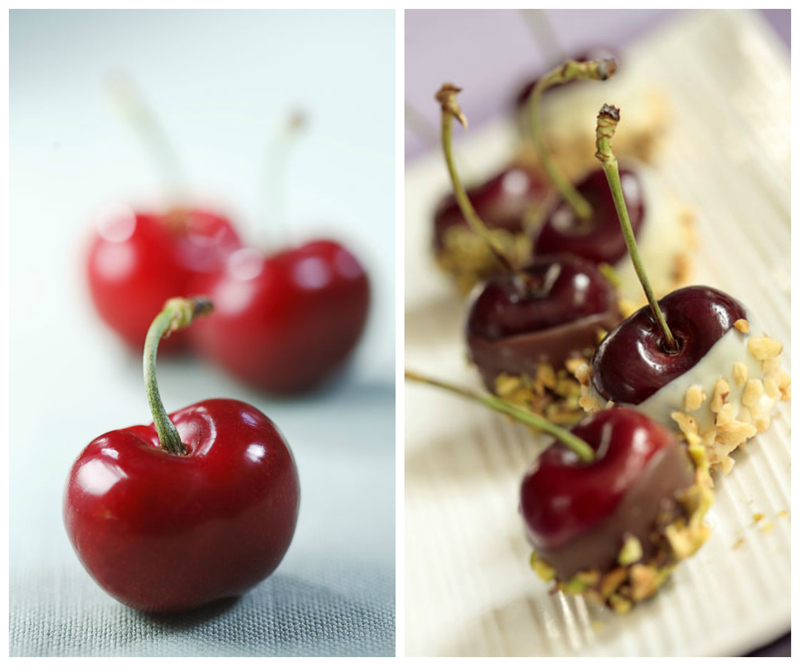 PS: LOVE the cherries dipped in the chocolate – is that pistachios on the bottom of those? Amazing! OMG, this is making me crave summer even more..it’s winter downunder… Stunning, pics! Gorgeous, simple, lovely salad! I love your recipes, they are always so seasonal and appropriate.